On September 27, 1944, The Kassel Mission, which resulted in the largest loss by a United States Army Air Forces (USAAF) group on any mission in World War II, was so successfully covered up that even today few non-WWII experts are even aware it occurred. The USAAF conducted roughly twenty bombing raids over Kassel, Germany from 1942 through 1945. 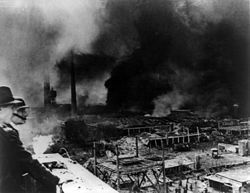 These raids resulted in severe fires, the deaths of at least 10,000 inhabitants of the city, and the destruction of much of the city center. Eventually, as the war began to conclude, American and British forces took the city following a four day battle from April 1st through 2nd, 1945. Nazi Germany lost at least fifty killed in the battle and another 5,600 taken as prisoners of war. In the final land battle that took the city, Allied losses were light. That was not the case on September 27, 1944. In a battle that lasted perhaps just minutes, America’s 445th Bomb Group suffered the worst losses of any American bomb group in all of World War II. The battle began with America’s 39 planes facing an attack by between 100 and 150 German fighters. The Americans used their famed B-24 Liberator to conduct their bombing raid, whereas the German fighters defending their city consisted of FW-190s and ME-109s. The outnumbered Americans were nearly completely wiped out with 25 bombers crashing into German soil, two planes crash-landing in occupied France, and one crashing near Brussels, Belgium. Two that did cross the English Channel were forced to land at the emergency strip at Manston, while one crashed near the base in Norfolk, and only a mere four American bombers actually landed at Tibenham. In addition to the loss of planes, 115 out of 238 pilots and crewmen were killed in action or died of injuries sustained in the brief battle. Two more died in crashes in Norfolk and in Belgium, respectively. By contrast and despite numerical superiority, Germany lost a comparable number of 29 planes with 18 of their pilots being killed in action. Regardless of concerns about morale, America could sustain its losses at this point in the war much more than Germany could and despite the tragedy for America, Germany would still ultimately lose the world’s worst war. Indeed, as indicated above, the overall devastation to Kassel over the course of the war is almost difficult to comprehend. For a thorough website dedicated to the mission, please visit http://kasselmission.com/overview.html. For a discussion on the cover up, please see the chapter titled “The Eighth United States Air Force Cover-Up–Why?” in Tom Harrison Kassel (Xlibris Corporation, 2013), 157-158. Elson, Aaron. John Cadden: A Kassel Mission Interview. CreateSpace Independent Publishing Platform, 2013. The featured image in this article, a photograph of a 93d Bomb Group B-24D-1-CO Liberator, AAF Serial No. 41-23711, at RAF Alconbury, England, in 1942, is a work of a U.S. Air Force Airman or employee, taken or made as part of that person’s official duties. As a work of the U.S. federal government, the image or file is in the public domain in the United States. Previous ArticleToday is National Pancake Day!